After a lifetime of being a cat person, a dog came into my life. It’s a long story but suffice it to say that it was a somewhat unorthodox adoption. Being half-Scottish, and having traveled to Scotland several times, I have quite a few souvenirs emblazoned with the ubiquitous Westie and/or Scottie. I always dreamed of owning a Westie, but alas, being a cat person, I was warned that Westies were hard-wired to hunt small furry things; therefore, introducing a Westie to my middle-aged Persian would not be a good idea. Then some friends told me about a friend of theirs who was trying to find a good home for her two-year old Westie. She’s a nun and was returning to her convent after living in an apartment for several years. The “Westie” had been a gift from the doctor she was working for and while she loved him dearly, she could not bring him to the convent when she moved. As it turns out, the dog in question was not a Westie at all, and not two years old. 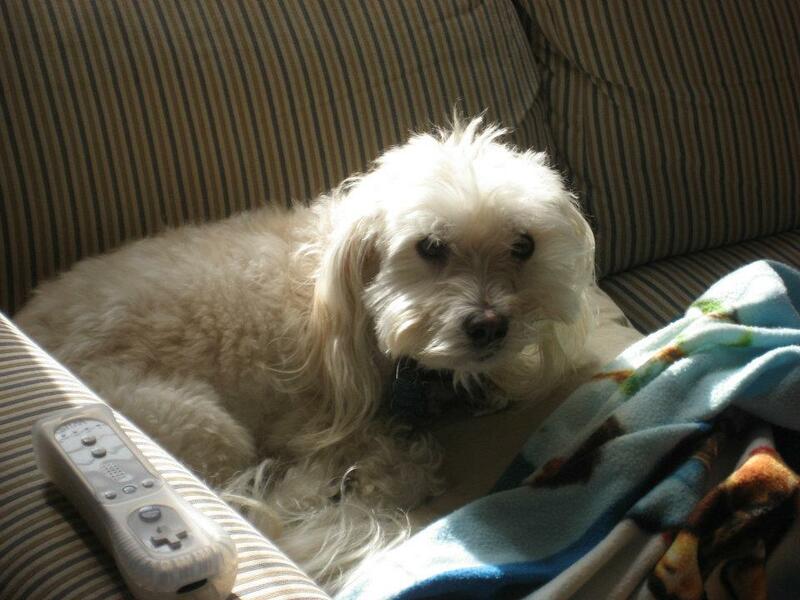 He was a biscuit-colored, six-year old Maltipoo named Puccini. Did I mention that my husband studied voice in college and loved opera? Match. Made. In. Heaven. After a lengthy “getting-to-know-you” phase, we cleared the necessary background checks and became the new owners of our adorable little rascal, Puccini. He is a good dog, a really sweet, smart dog, and yes, he has us all wrapped around his back paw! A few weeks ago, Puccini decided he was no longer going to climb the stairs to the second floor of our home. This had happened when we first adopted him; he would lie at the bottom of the stairs and cry for someone to carry him up. With lots of patience and doggy treats, he finally conquered the stairs. Occasionally, however, he would slip near the top and fall a few steps before catching himself. (In all fairness, the stairs are a bit steeper than normal household stairs.) For several days following the mishap, he would be timid about the climb, often stopping at the third step from the top, retreating to the bottom, and trying again. When this scenario presented itself again, though, my husband was sure that he had injured his back paw in his most recent slip down the steps. Or, maybe, there was something wrong with his whole hip? Coincidentally, it was time for his check-up at the vet to renew his heart worm medication and the appointment was a week away. So, my big Italian American ex-football playing husband did the most understandable thing: he carried him up the stairs every night at bedtime. Now, I ask you, what would you do if suddenly someone would willingly carry you up the stairs every night? Would you ever climb those stairs again? No, of course, you wouldn’t. So, each night, Puccini would lie at the bottom of the stairs, and cry for someone to carry him up. This went on all week. Saturday morning came and the vet said, of course, that there was nothing wrong with his back paw and, in addition to being perfectly healthy, perhaps he was just a tiny bit spoiled? A tiny bit? Really? As I was texting the update on the dog’s health to my older daughter, it occurred to me that this whole episode was reminiscent of another time in our lives when my husband fell victim to a perfectly healthy creature that was just a tiny bit spoiled. Daughter #1 was carried everywhere for almost two years. Her baby shoes and toddler shoes were retired looking brand new, only put aside when her foot no longer fit in them. She was never permitted to walk anywhere, so much so that we had a rare but world-class tantrum outside of a strip mall when she was not permitted to walk on the concrete divider between parking spaces. “She might fall and hurt herself” was the response when I suggested we just let her do it. “Fall?” “Hurt herself?” The concrete divider was at most four inches high. It’s no wonder that she had still not taken her first steps on her first birthday, and was photographed dragging herself around the living room on her bottom to get to new presents to open. Daughter #2 took care of all of this; she being the daredevil from the minute she entered this world just three weeks after her sister’s second birthday. At eighteen months Daughter #2 was standing on the top of the back of the sofa squealing with delight as she prepared to hurl herself to the sofa cushions. She didn’t start walking so much as she started running, and climbing, and tumbling. After several days of not being carried up the stairs like the Prince of Wales, Puccini is back to normal, running up and down the stairs at will. Daughter #1 is now independent and fearless, with a master’s degree, her own apartment, and a full time job. Daughter #2, who has mellowed into a deep, sensitive thinker, has been known to occasionally carry Puccini up the stairs. I’m keeping an eye on her.